Gunflint Lodge has been in existence for over 85 years and we thought you might enjoy reading about some of the historical highlights of the lodge and the four generations of Spunners/Kerfoots who have run it since they bought it from the Blankenburgs. Mrs. Doris (Dora) Blankenburg and her son, Russell started Gunflint Lodge in 1925. The Blankenburgs were originally from Chicago and owned a resort called Light House Lodge in northern Wisconsin. One summer some of the guests commented that the next summer they would be going up to a new area just opening up in northern Minnesota. The name of the area was the Gunflint Trail. Russell decided to come to the Gunflint Trail area and look around. As a result of this trip, he urged his mother to buy a piece of land on Gunflint Lake, which was the end of the Gunflint Trail at that time. After a couple of years of operation, Mrs. Blankenburg felt that operating two resorts in two states stretched her too thin. She put Gunflint Lodge up for sale. One of Mrs. Blankenburg’s friends from Illinois was Mrs. Mae Spunner. Her husband, George, had given the Blankenburgs advice on the purchase of their Wisconsin resort. When Gunflint Lodge was put on the market, Mrs. Spunner expressed interest in purchasing it. Mae Spunner brought her daughter, Justine, up with her to discuss the purchase of the resort from Dora Blankenburg. While the two women finalized the purchase of the resort, Justine took her first canoe trip with a college friend and a guide. The trip was down the Granite River to Saganaga Lake. At the time Justine had just finished her undergraduate work at Northwestern University and hoped to become a physician. While in school, Justine had agreed to come up during the summers and help her mother run the resort. The two Spunner women purchased Gunflint which was a very small lodge building with a store carrying supplies for the Indians and fishing tackle for the guests, plus a dining room to serve meals. They also bought three log guest cabins, an owner’s cabin, and a small staff cabin. The resort had neither indoor plumbing nor electric service. Telephone service was also a dream for the future. Justine wrote about the immediate improvements her mother made. “Mother made arrangements locally to enlarge the lodge by having an extension built on one side complete with a large fireplace for a lounge and an extension built on the other side with a fireplace and dining room. This also called for changes in the kitchen. Beside the changes in the lodge structure, George Bayle was hired to build tables and chairs from local trees – primarily birch that furnished the new additions. All of the table tops were mounted on large roots.” An indication of Mrs. Spunner’s priorities at that time is shown by the fact that both of these additions faced the incoming road, not the lake. Two more cabins and a boat house were also added at this time. By 1933 the depression had severely hit the Spunner family and they were forced to give up their home in Illinois and move permanently to Gunflint. This had never been in the plans. Justine put off continuing her education at Northwestern and her dreams of a medical career for a year and then one more year and then forever. Luckily by this time she had fallen in love with the Northwoods. Also in 1933 Bill Kerfoot, son of the president of Hamline University, arrived on the Gunflint Trail. The depression had cut short his plans of a career in the foreign service. Bill camped on the sand beach at the west end of Gunflint. He was eager for any job at any rate of pay. Justine finally took him on for room and board. According to a friend at the time, she decided he was “good with the guests.” In September, 1934, Bill and Justine were married. With two of them working together more projects around the resort could be accomplished. In 1935-36 they built themselves a log cabin home after a learning experience on a smaller building. That cabin would be Justine’s home until her death in 2001. Several more cabins were added. They started sending out a newsletter to past guests around 1937-38. Bill would do the writing and Justine was the illustrator. An old mimeograph machine cranked out the copies. A large building housing a gift shop/trading post with three small units was added in the early 1940’s. The outfitting of parties for canoe trips in the wilderness continued and expanded. After the war, the resorts in the area felt the pressure to modernize. Old 32-volt electric generators were replaced by army surplus 120-volt generators. The resorts started a telephone company. Adding indoor plumbing became necessary. Justine drew plans of the cabins and went to Montgomery Wards. From her plans the store employees drew up a plumbing system and sold her all that was needed to install it. Justine went home and learned through practical experience to be a plumber. Wood stoves were replaced with “modern” fuel oil stoves. An army surplus field telephone system was installed between buildings. Work started on the new lodge as soon as the fire debris were cleaned up. Everyone worked like they never had before. Workdays lengthened. Coffee breaks were unheard of. Incoming guests were greeted from the top of a ladder. Some guests came in after a day of fishing and picked up a hammer to help for a bit. The building quickly took shape. The new lodge went into operation in August. It wasn’t complete but it was functional. The floor was sub-floor planks. The walls had no paneling. There were no fireplaces. Oak floors, paneling, new dining room furniture, fireplaces, and even curtains would be added in time for the next season. In August these extras were trivial. The kitchen, however, was completely finished. This building, designed on the spur of the moment, has served the resort well for many years. Bruce married Sue in 1968. During the first years of their marriage, Justine ran a branch of the canoe outfitters, Grand Marais Northwoods Outfitters, in Grand Marais and lived there from May to October. When she moved back to Gunflint, it was to run the canoe outfitters. That lasted only a couple of years before Bruce bought her out. Although Justine always retained a very active interest in the business, the next generation was now truly in place. Once again an ambitious young couple were running Gunflint Lodge. Bruce and Sue worked to expand the summer business. About 1975 a friend named Ernie Schmidt suggested that they add a naturalist to the staff and he had already picked out the person for the job. Rather than offering golf, tennis and swimming pools, Ernie felt that Gunflint should specialize in introducing guests to the Northwoods. The naturalist’s job was to show guest the Northwoods surrounding the resort. Hikes, breakfast paddles, berry-picking trips and sunset canoe trips were some of the activities that were offered. Meanwhile the business at the resort continued to grow, especially the winter business. By the start of the 1990’s, Bruce and Sue made the decision to winterize the main lodge and keep it open for the cross-country ski season. The resort closed in mid-October the year of the change over. In six weeks, the main building was fully winterized and ready to go. Hand-in-hand with the new building was an upgrade of the restaurant menu. Since that time winter business has grown to be a vital part of the resort. In May of 2001, Justine passed away. It was a great loss for the Gunflint community. She first came in 1929 and lived the rest of her life on Gunflint Lake. For many years on the Gunflint Trail, the name “Justine” meant only one person. Her love of this area has been carried on through her children, grandchildren and great-grandchildren along with the thousands of guests who interacted with her over the years. 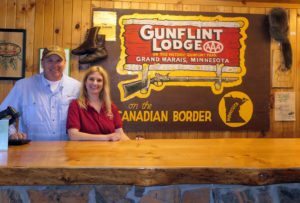 In June or 2016 John and Mindy Fredrikson purchased Gunflint Lodge & Outfitters from Bruce and Sue Kerfoot. John, Mindy and their son Jack now make Gunflint their year round home and look forward to greeting you in the lodge when you come up to visit this very special place.